Designed specifically to fit the AK74SU Krink (Krinkov). Shipping: 1st Class Mail rate is actually the price for USPS Priority. 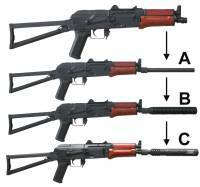 This page is ONLY for the ADAPTER / BARREL EXTENSION seen as "A" in the photo above. You may also order (at an additional cost) the M4 and or SOCOM Fake Silencer that slides over the top of the ADAPTER via the "OPTIONS" tab. Item "C" SOCOM Fake Silencer for HK USC 45. The "OPTIONS" tab gives you Special Discounts on BOTH of these items. Regular Retail Prices for either is $175.00. This AK74SU adapter is weapons grade steel. The length is 258.5mm / 10.15 inches, which if permanently attached will give you about 16.50" of barrel. This added length will give you the much needed barrel length to make a 100% BATF legal rifle. 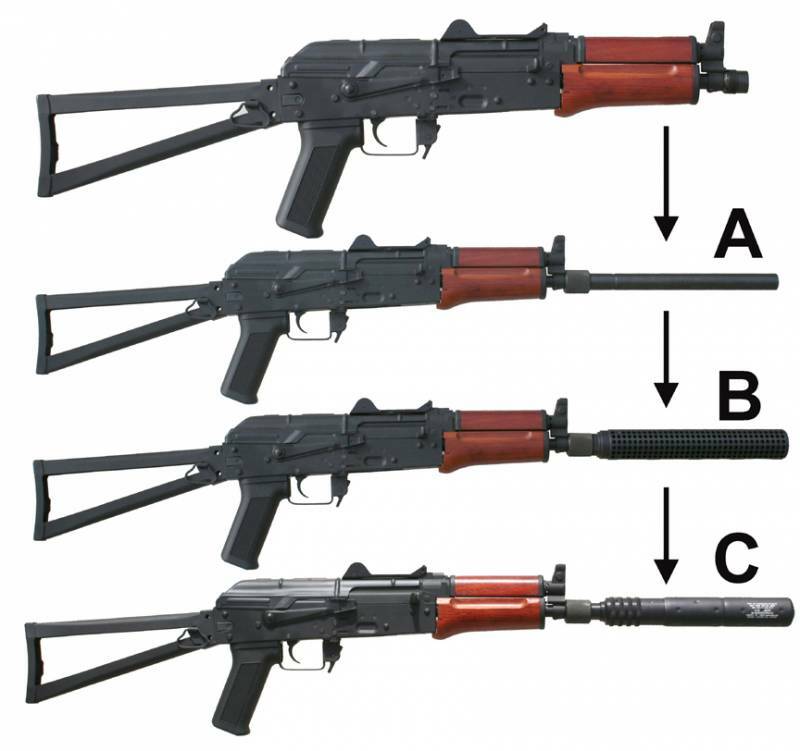 So now you can turn your K-VAR AK 74 SU parts set into a legal semi rifle. This will fit any Bulgarian, Russian, etc weapon with a 24mm Right Hand Thread. The internal hole diameter that the bullet passes through is 0.610" in diameter. We made this large enough to keep the escaping gases from affecting the bullet trajectory. The larger hole size also helps keep the weight down. In the end this is much lighter than the long 16' barrel version by K-VAR. If you have the 16" barrel from KVAR you can also use this item, as it slides over the 16" thin pencil barrel as well, hiding the entire barrel. We deliberately made this adapter / barrel extension out of steel so it can easily be blind pinned and welded to meet BATF permanently attached criteria. All MFI Barrel Shrouds / Fake Silencer / Mock Suppressors are 100% Cosmetic & have ZERO Function. Unlike true vented barrel shrouds / heat shields our products make NO CLAIM to any protection from heat that is generated from the barrel. As you fire, your barrel will heat up and that heat is directly transferred to the MFI Product. Therefore you should NEVER grab hold of the MFI Product if you have fired more than 5 rounds, as you WILL burn your hands. Made of Weapons Grade Steel. Fits ONLY a 24mm Right Hand Thread. Maximum Outer Diameter (Long Part): = 20.40mm or 0.810 inches. Maximum Internal Diameter: = 15.10mm or 0.595 inches. Maximum Length: = 259mm or 10.20 inches. Length From Barrel Nut Forward: = 228.64mm or 9.00 inches. Mil. Spec. Black Oxide to give the unit a semi flat finish. NOTE: These do NOT suppress sound in any way and are 100% legal for the regular civilian to own in all 50 US States. Availability Remarks: ETA?? Maybe 01-2015? Shipping Remarks: 1st Class Mail rate is actually the price for USPS Priority.